If you’re not a potter you may not be familiar with glazes: what they are, how they’re made and how applied. 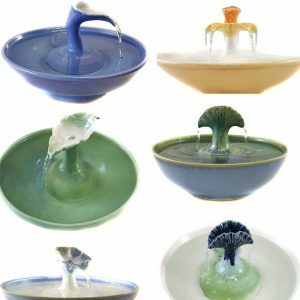 The glaze is the coating that protects the ceramic piece, and, in the case of cat fountains, your cat’s drinking water. The glazing process is especially important when the goal is to have a food-safe product. The process is quite interesting, as you will see below. It is also important to understand that the surfaces of any cat fountain can potentially leech chemicals into the water; causing your cat to drink dangerous elements from plastic, unsafe ceramics, or other materials. For this reason we take every precaution to ensure that all of our glazes and ceramics are food-safe and properly finished. Wikipedia defines a glaze as an impervious layer or coating of a vitreous substance which has been fused to a ceramic body through firing. Glazes can serve to color, decorate, waterproof and give strength to an item. Minerals used in glaze making – fluxes, colorants, opacifiers, etc. Silica – Creates glass. Examples: quartz, flint, pure silica. Alumina – Stiffens the glaze so it doesn’t slide off the pot. 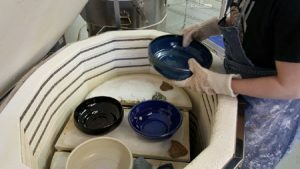 Flux – Causes the glaze to melt at a low enough temperature to be used in ceramics. There are of course many other minerals used in glazes which have different attributes and effects but which are not strictly necessary. There are the colorants, such as copper, which gives greens and cobalt which creates blues; opacifiers, such as tin which make a glaze more opaque and minerals such as rutile which create color variations within a glaze. It should be noted that all the elements of a glaze are minerals which come from the earth. Silica, the primary glass former, melts at over 3,000°F, which is why fluxes which lower that temperature are necessary. 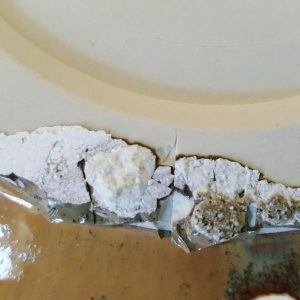 There are many sources for fluxes – feldspar, talc, dolomite, calcium carbonate and more – containing different minerals which affect the glaze differently but they all serve to combine with the silica and significantly lower the melting temperature. Another effect of this is that they make the glaze more runny. Finding ways to make a glaze melt at a lower temperature has been valued and pursued for thousands of years for one very simple reason. It greatly lowers the fuel required for the firing. Lead was one of the best fluxes both for its ability to lower the melting temperature and it gave very bright colors. It is now largely banned in the United States because of its toxicity and none of our ceramic materials contains lead. As lead is not regulated in China, as it is in America, ceramic cat fountains from there may contain lead. This is nearly impossible to know. 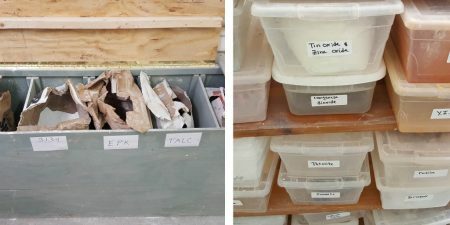 Because fluxes are needed, so are stiffeners – the primary one being alumina – which keeps the glaze on the pot rather than sliding onto the kiln shelf. At ThirstyCats we fire to what is called cone six – 2,232°F. That is the temperature at which our stoneware clay and the glazes on it mature, and runny glazes have to be applied very carefully. Our Mahogany glaze is a runny glaze and if to much is used at the bottom of a fountain bowl or center piece, it will run, stick to the shelf and as it cools, break the piece apart, and any of the glazes applied heavily will do the same. Most of the colors we achieve come from layering one glaze over another and this greatly increases the risk of running. For example our Antique Copper is applied this way and, sometimes we get it wrong. Speaking of application, we spray our glazes in a specially designed spray booth, which you can see in operation below. Most home and many studio potters brush or dip their ware. We find that spraying gives a much superior surface, which adds both to the attractiveness of the glaze as well as making your ceramic cat fountain easier to clean. And for cat fountains, this is important. If a fountain is too hard to clean it likely won’t get the cleaning it needs. Even our matte glazes, though not glossy, are smooth. But spraying has other virtues as well. It permits more variability in the glazing of a piece. For example, we can spray the outside one color and the inside another. That would be very difficult to achieve by dipping, and painting almost invariably leaves brush strokes. Or we can feather the spray to give a natural blending of one color into another. As with everything we do here at ThirstyCat Fountains, we take our glazes and glazing seriously. It matters to us and we know it matters to you.